I'm almost certain JK Rowling is a big fan of Rickman. After seeing the uncanny similarities that Alan Rickman's past characters and Snape share, I'm sure that Snape was written with Alan in mind. Below is a list of the observations I found. (I know on the Yahoo Archive group there's also a list of AR/JKR similarities, but I have not read that, so any resemblances between these two lists are purely coincidental.) Anyway, onwards! In the Barchester Chronicles (1984), Alan plays a greasy haired, not-so-nice character named Slope. In Harry Potter (published 1998), Snape is a greasy haired, not-so-nice character named Snape. In Truly Madly Deeply (1992), Nina's nephew is named Harry, who has dark brown hair with bangs, and has a scar on his forehead! In Robin Hood Prince Of Thieves (1991) Alan's plays the Sheriff of Nottingham. He acts evil, has greasy black hair, a beard, wears black robes, and prowls around in a dungeon of a castle. He was an agent, working for the witch Mortiana, but in the end has a falling out with her. Not to mention, he has a great hooked nose, which is often cartoonishly exaggerated by the camera. In the scene where the Sheriff first appears, he is revealed to us after taking off a mask. The Sheriff's famous line: "Call off Christmas!" In the book Harry Potter, Snape has greasy black hair, a cartoonishly exaggerated hooked nose, wears black robes, and prowls around in the dungeons of a castle. And did you know Snape originally had a beard? Snape was a Deatheater. He was an agent, working for the Dark Lord Voldemort, but in the end had a falling out with him. And guess what Snape wore? Masks. Alan is a supporter of Amnesty International, an organization promoting human rights worldwide. The main way Amnesty members pressure governments to release unjustly held prisoners is to write massive amounts of letters to the governments holding these prisoners. Alan made Closet Land (1991) in support of Amnesty. This movie is basically about a writer who is held captive and being forced to confess to political subversion in her childen's book, which is entitled Closet Land. Guess where Rowling worked before being a writer? Why, in Amnesty International. And where did Harry Potter live in the Dursleys' house? Why, in a little closet under the stairs. And how does Hogwarts rescue Harry from the Dursleys? Why, by sending in massive amounts of letters. In Mesmer (1994) Alan wears long velvetty robes, has long hair, and works in a drafty office filled with potion bottles and other sorts of weird objects. In Harry Potter, Snape has long robes, long hair, and works in a drafty office filled with potion bottles and other sorts of weird objects. In An Awfully Big Adventure (1996), Alan's character, O'Hara, sometimes wears a greasy black wig. O'Hara is enemies with a man named Meredith Potter. Potter wears round glasses and a gold and red scarf. In this movie, the uncle is a chubby fellow called Uncle Vernon. The aunt's name is Lily. There's a scene where O'Hara participates in a soccer match. Well, Snape has greasy black hair. Snape is enemies with Potter, Potter wears... do I really have to spell it all out for you? There's a scene (in the book) where Snape participates (well, referees) in a Quidditch match. In Michael Collins (1996), Alan's character has to wear women's clothing in order to flee from somewhere. In the Boggart scene of Harry Potter, Neville conjured up Snape wearing women's clothing. In Blow Dry (1999), Phil Allen works next to a hair salon called "The Cut Above." Overall, Alan Rickman speaks in a very silky, dark, rich voice that commands your attention. Snape speaks in a silky, dark, rich voice that commands your attention. Here's some news found on Rickman-fan.com. Daniel Radcliffe said in March 2004: "As far as I know, the only person on set who knows something about their character's future, or past as the case may be, is Alan Rickman. I think she may have told him something, but I don't know what it is, but it's very surprising." Surprising? Yeah, right. Rowling is just paying Alan some extra attention, which is expected from a Rickmaniac. Mr. Rickman starred in a movie version of a book called Sense and Sensibility. 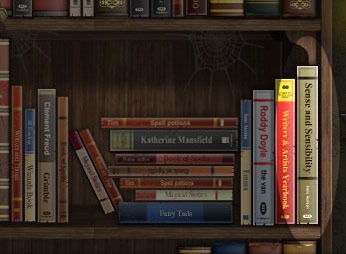 On JK Rowling's official website, there is a page with pictures of her favorite books. Guess which book is on there? That's right, Sense and Sensibility. (I've highlighted the book for you.) Click the screencap to see a bigger version. Still don't think Jo is a Rickmaniac who had Alan in mind as Snape even before casting began? 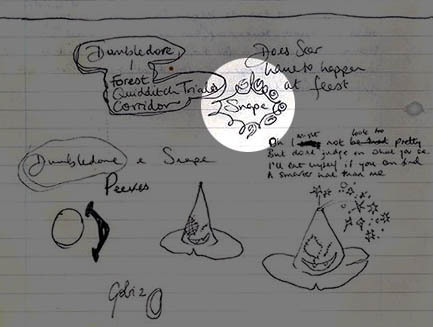 Well, on JK Rowling's website, there is a scan of an actual page of Jo's notebook. Guess whose name stands out above the rest? Snape's! (I've highlighted the section just for you.) Just look at those fancy squiggles around his name. Squiggles of love! Click on the pic for a bigger one. Alan was in a music video for a song called In Demand. The first lines of the lyrics are: "When we were together I was blown away, just like paper from a fan." Alan was in a short film called Murder, Obliquely, which was directed by Alfonso Cuaron. Harry Potter 3 is directed by Alfonso Cuaron. Alan was in a movie called An Awfully Big Adventure, directed by Mike Newell. Harry Potter 4 is directed by Mike Newell. (Scroll up to read some more totally snazzy coincidences between Harry Potter and An Awfully Big Adventure. As you all know, Alan Rickman plays Severus Snape in the Harry Potter movies. From JK Rowling's Official Site, the author reveals that she is a big Snape fan. The following excerpts are from an interview she did in Edinburgh for Harry Potter 5. JK: "I love writing Snape. Even though he is not always the nicest person, he is really fun to write." JK: "You always see a lot of Snape, because he is a gift of a character. I hesitate to say that I love him." Audience member: "I do." JK: "You do? This is a very worrying thing. Are you thinking about Alan Rickman or about Snape?" JK: "Apart from Harry, Snape is my favourite character because he is so complex and I just love him." JK: "Why do you love him? Why do people love Snape? I do not understand this. Again, it�s bad boy syndrome, isn�t it?" Yes, I think JK Rowling has made it clear that she loves Snape, don't you think? In the movie Dogma, Alan Rickman plays Metatron, who is a cranky yet good guy who acts as God's servant. The scar on Harry's forehead is a lightning bolt. When he first sees Snape his scar hurts, and he thinks that it is Snape (Alan Rickman) who is making it hurt. Where else can we find the name of "Florence"? Why, we know the infamous Florence from the Harry Potter books! Also, the description of Snape is similar to that of the sinister Raven in Poe's poem. Anyway, after all is said and done, I've concluded one thing. In order to have Alan at your fingertips, you need to write a book or screenplay, and have him act in it.